As far as J. Edgar is concerned behind the thin patina of gloss, the actual true fascinating story and an impressive cast, there is otherwise very little to enjoy. Eastwood directs it all almost by numbers, as if he wasn’t even there, without any visual flair, any care or attention for details, any subtlety, or worse any real ideas or anything to say. Every decision behind the making of this film seems to have been wrong one: the decision to break the film up, flashing backwards and forwards makes it too complicated to follow and keeps the audience emotionally detached for at least the whole first half. The decision to allow Eastwood to recycle his usual plain piano notes soundtrack, which sounds exactly the same as every other one of his films and actually here is used in the most cheesy possible way to its worse effect. The decision to have J Edgar Hoover telling the story of his life to a biographer (my God, can it all be a bit more obvious please!? ), but most crucially, the decision to have Di Caprio & Co acting with (not very good) prosthetics for half of the film thus forcing the audience to get constantly distracted by the bad hair lines, the dodgy fake wrinkles and the rubbery feel on people’s faces. I must have spent half of the film looking at the make-up thinking “God, this is bad” and even when sometimes I though “mmm, this is a bit better…” I was always aware of it. Even when you look at the publicity stills from the movie (the picture above this review) you can see tell how fake the hairline is. In an age of seamless CGI (look at the ageing effects of Benjamin Button!!) I am surprise to see such shoddy work (hopefully it’ll look alright on DVD, but on the big screen I saw this, digitally projected, it all looked incredibly ropey). I am usually a huge fan of Di Caprio: I loved him since “A Boy’s life” when he upstaged even Robert DeNiro (in a time where DeNiro was actually still good), he was absolutely amazing in “What’s Eating Gilberg Grape” (to this day one of my favourite films), I thought he was one of the most mesmerizing Romeo in Baz Lurhman’s “Romeo + Juliet“, I even liked him in Titanic (in fact, I think, special effects aside, some of the success of that film was because of his ability to draw us in.. and to draw millions of little girls back to see the film over and over again). He was great in the Aviator, the Departed and he even managed to bypass the fact that he had a baby-face in both Catch me if you Can and Revolutionary Road, just because he was so good in both! 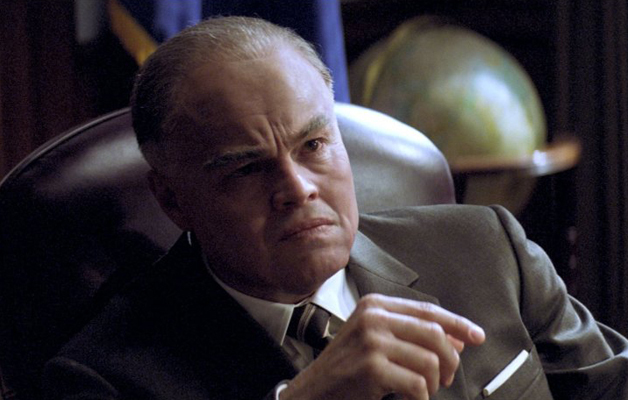 But on “J.Edgar” Di Caprio is forced to spend half of the film covered in that damn thick prosthetics which prevents him to convey any real emotion to his character. I felt like I was always watching Di Caprio in a fat-suit as opposed to J.Edgar. To be completely honest, it’s not all his fault. Eastwood ‘s direction jumps from scene to scene, sometimes quite randomly, trying to cover as much ground as possible from the undoubtedly intriguing real life. There are way too many characters, too many story lines, most of which are left hanging without a real sense of place and eventually the emotional focus of the film gets diluted and any understanding of his character gets lost. There are some potentially very strong moments: for example the relationship between J.Edgar and his domineering mother (the always very watchable Judi Dench) and the sexual tension between Di Caprio and Armie Hammer, are both potentially very strong, however in the hands of Eastwood they all fall into schmaltzy and clichés as those cheesy piano notes tell us “a now, watch out… this is going to be emotional”. It’s all handled so badly that it even kills a potentially good performance like the one by Di Caprio. The rest is just a hollow mess where characters come and go without leaving any real mark: we never really know why Naomi Watts‘s character decides to stick with J. Edgar right until the end, we never really get a grip on the procedures that made finger prints database possible, we never really get a sense of what could have happen if the real J.Edgar had been exposed and while all sorts of lawyers and politicians appear and disappear in a seemingly random succession we are getting more and more lost in irrelevant subplots. It could have been a fascinating story: a closeted gay, the first director of FBI, a man who lived through presidents like Truman, Kennedy and Nixon. There could have been so much here and yet it’s all wasted in bad storytelling, staging and wrong choices at every turn. I blame the direction, the script (surprisingly the same person who had penned the quite gentle and a lot more subtle Milk),but also the editing: obviously a lot has been cut out trying to condense 50 years into 137 minutes. But instead of loosing entire subplots and deciding to make it all more focused, somebody made a terrible decision to actually have it all in. The first 20/30 minutes are some of the most disjointed and messy I’ve seen in any film recently. It would probably deceiver even less than a 5/10 rating, but some of central performances are quite good, despite everything else around them. Clint Eastwood is one of the greatest living American auteurs and it is in the last ten years the he has reached his peak. ‘J. Edgar’ is a pitch perfect approach to the biopic that uses ambiguity to avoid the problems of historical representation while still providing a thoughtful depiction of its subject. I’d also have to say that ‘Hereafter’ is an incredibly beautiful (and very European) meditation on the human need to deal with the concept of death. ‘Invictus’ may not reach these peaks but it is still a nice way to interweave history and the traditional sporting pic. Clint has directed 33 films since his first effort, ‘Play Misty for Me’. Through these films one can see a true auteur develop, moving slowly from being competent producer of genre pieces to a mature observer of the human condition.